At Barker Produce, Food Safety is at the forefront of our operation and is practiced on a daily basis. 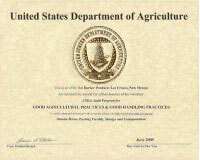 Every member of the Barker Produce Team fully understands and executes our Food Safety Program. Our proactive system encompasses Good Agricultural Practice (GAP), Good Handling Practice (GHP), Quality Control and Employee Safety. Our onsite training program anticipates potential product and equipment hazards, while providing the tools and knowledge to resolve and prevent these hazards from occurring.